Can we completely close the aquaponics loop? Would it be possible to have a system that produces its own fish food and remains productive without added materials? Yes the loop is “closed” from a water perspective. But we have a consumption when we harvest the vegetables plus the evaporation so we frequently add new water into the system. Talking about fish food, I often receive the question: “How to produce our own fish food and therefore close the loop.” This is an interesting idea but is it really possible? But those techniques are they really closing the loop? I mean, if we produce the fish food thanks to the food produced in aquaponics, will the system remain sustainable and offer some food? If we think of the system as a black box, where we are able to produce food from organic matter (fish food) or nitrogen (fertiliser) we understand that we need to add something in the system in order to obtain something else. If we don’t add anything to the system and continue to harvest the vegetables and fish, at one point the quantity of elements in the system will be to low and the system will stop producing. (it will be empty). In aquaponics we have the chance to need only a fraction of energy and water compared to what is needed in the classic food industry. 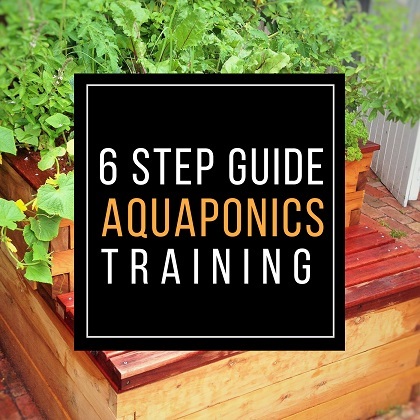 As explained in other videos we don’t use pesticides in aquaponics. From an organic matters perspective and especially from a fish meal consumption, aquaponics is not better than classic fish farming and aquaculture. The fish food used is generally the same and the impact on the environment is negative. If we can produce our own fish food in the aquaponics setup it will definitely improve the sustainability of the system. Even if everything is recycled it seems impossible to completely close the loop and to maintain the system productive as you will continually harvest your crop (fish and vegetables) so the nitrogen and minerals present in the system will decrease in quantity. Possibility to add a compost or other system on top of the growbed to add minerals and other nitrogen in the system. There is another possibility to add nitrogen. Air composed of nitrogen. Unfortunately plants are not able to absorb this form of nitrogen form the air. Some bacteria are able to absorb this nitrogen and to transform it into a form of nitrogen available for the plants. In this case the nitrogen is present and theoretically it adds nitrogen to the system. We can then harvest crop and have a system remaining productive.